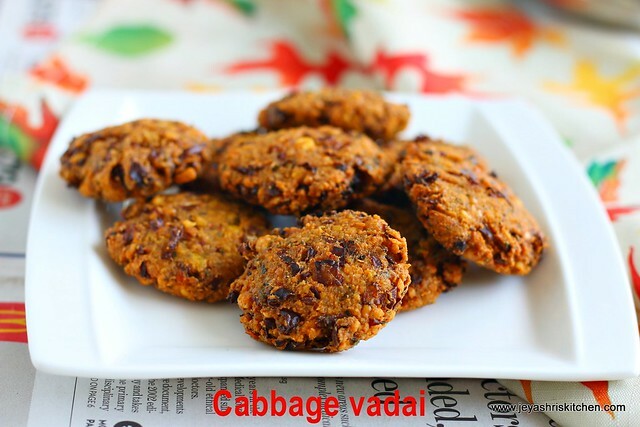 Cabbage masala vadai is basically the paruppu vadai | masal vadai we make with channa dal. Last friday i made Varalakshmi pooja at home i made this cabbage masala vadai in the evening for my guests along with puliyodarai, coconut rice, apple kheer and curd rice. Everyone loved the cabbage masala vadai. As it is a pooja invite i made everything without onion and garlic. When everyone asked me about the vada recipe i told them that it is the usual paruppu vadai with cabbage. 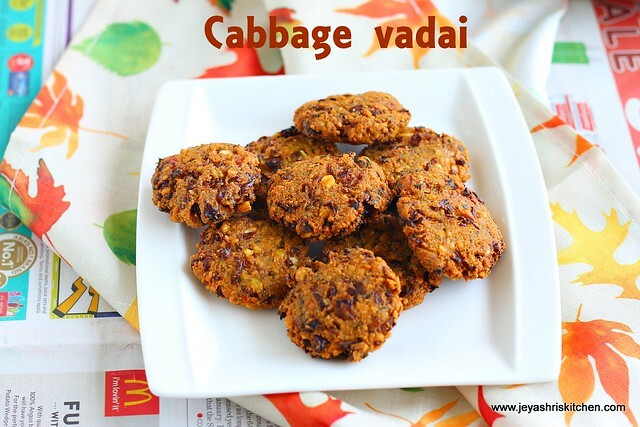 But still many of them requested to post the recipe of cabbage masala vadai in jeyashris kitchen. So i made this on Sunday again and clicked the pictures and video. From now till the end of Navaratri Jeyashri's Kitchen will feature only no onion no garlic recipes. stay tuned for more interesting jain recipes coming up . Check out my complete collection of no onion no garlic recipes. Soak the channa dal and toor dal in water for 2 hours. You can ad the dried chili too while soaking. It will help in easy grinding of the red chili. Drain the water completely and add in the mint leaves, ginger and curry leaves. Grind coarsely without adding any water. Finely chop the cabbage and keep it. Just before making the vadai add salt and cabbage and mix well. Heat oil in a pan . Take a lemon sized portion of the dough and make it into a round patties by flattening it. When the oil is hot keep the oil in medium flame. Fry the made patties in batches. Once they become golden brown take it out from oil and drain in the kitchen towel. Repeat this for rest of the dough. Cabbage masala vadai is ready to serve. Serve hot with tea or you can have this with curd rice too. Instead of cabbage you can add grated beetroot of finely chopped vazhaipoo or grated carrots too. Mint leaves gives and excellent flavour to the vadas, so do not skip it. You can add some coriander leaves too while grinding. We generally do not add fennel seeds |sombu during pooja days. If you want you can add it too while grinding. Always fry the vadai in medium flame, if the oil is too hot it will get cooked on the outer side very fast. And inside of the vadas will remain uncooked. Hello Jeyashri. I make these Vadais with Pattani Kadalai which is called split yellow peas. (Mckenzie brand I think or even the local brand ). They stay crisp on the outer and much softer while and stay that way for a long time !! I have heard my mother say they use this only for street foods. (Not fully sure ) Please try it and post your comments.